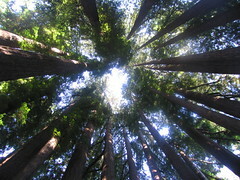 Inside a glade of redwoods, up on the summit of Bear Mountain (where there are no bears). Roaring Camp Railroads, Felton, nr. Santa Cruz, California. > Inside a glade of redwoods, up on the summit of Bear Mountain (where there are no bears). Do not be so quick to ssume there are no bears there. Last year, several bears were spotted in Watsonville. They are migrating northward from the Ventanna wilderness. We expect bears to take up residency in the Santa Cruz mountains. Thankfully the mountain lions already in the area will keep their population in check. BTW, you were about 6 miles from my place. I aodre being in redwood cathedrals. I adore the smell, the quality of light, the feel underfoot.